Add the perfect finishing touch to your piers with a GFRC pier cap from Stromberg. A distinguished way to accentuate your exterior architectural accents, a pier cap is both eye-catching and elegant. Pier caps balance your overall landscape and express the art of living well. Stromberg offers GFRC pier caps in an array of textures, colors and finishes that will fit right into the natural environment of your outdoors. Even though these pier caps are available in natural textures and finishes you’d swear are the real thing, the glass fiber reinforced concrete they’re made of is an incredibly durable material that will stand up to anything Mother Nature can dish out; they won’t crack, corrode or fade. Long hours of sunlight, harsh winds and heavy rain are no match for GFRC, hence its reputation for being Stromberg’s most popular material. Stromberg Architectural pioneered the use of GFRC and they have 30 years of experience in its use. They’ll walk you through the entire process of choosing and designing your GFRC pier caps. Builders, remodelers and home owners alike find their experience with Stromberg a pleasurable one; it’s easy to see why they lead the industry in these distinctive architectural elements. Stromberg has one of the largest selections of pier caps anywhere on the market today. Choose from one of their stock designs, or have them work with you to design one that’s all your own. Their team of professionals is ready and willing to work with you on your design ideas. Stromberg also has customer service that is second to none, offering initial quotes and consultations at no charge. GFRC is a lightweight product that installs easily and quickly, helping you cut shipping costs. Even though it doesn’t weigh much, it’s extremely durable and attractive. GFRC is incredibly realistic looking; it can be fashioned to look like natural stone, terra cotta or even wood. Your GFRC pier caps can even be made with a smooth finish so that you can paint them to match your surrounding décor. GFRC is a completely green product made from recycled materials. Using GFRC pier caps will help you get LEED points. Glass Fiber Reinforced Concrete panels are virtually maintenance free; once they’re installed, they’ll be there for generations. 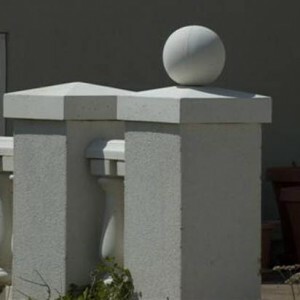 GFRC pier caps are a great way to redecorate, update and structurally improve your existing landscape. No matter the size of your project, large or small, Stromberg Architectural will be there to guide you every step of the way. Their GFRC pier caps are an excellent product and you can count on their personable support people; they’ll not only make your project possible, they’ll make it fantastic. Contact them today at 903-454-0904 for your free custom quote, or email them.